The wrist is a complicated region of bones, ligaments, tendons and nerves. Wrist pain is a very common ailment affecting both the pediatric and adult population. The pain could present after a traumatic injury, or gradually over time. 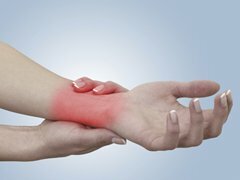 Wrist pain can frequently be significant in nature and interfere with daily living. Common causes of wrist pain include fracture, tendonitis, arthritis, nerve compression and sprains/ligament injury. Evaluation of a wrist pain should be performed by a hand surgeon. The work-up involves a detailed history and physical examination followed by x-rays. Additional work-up involving MRIs, nerve testing (EMG/nerve conduction velocity), and blood work may be necessary in certain cases. Overall treatment for wrist pain depends on the specific diagnosis. Treatment options include anti-inflammatories, splinting/casting and occupational therapy. More extensive treatment may be necessary in certain cases requiring steroid injections or surgery. If you are experiencing prolonged or significant wrist pain that is interfering with your activities, feel free to contact our office to schedule an appointment. Fractures of the wrist are very common injuries experienced across all ages. These injuries are frequently caused by falls, sports injuries, and motor vehicle/motorcycle accidents. Fractures around the wrist region involve fractures of the distal radius, distal ulna and or scaphoid bone. Most wrist fractures are accompanied by significant pain, swelling and bruising. Patients who have suffered a traumatic event with significant wrist pain and swelling should be urgently evaluated with xrays to assess for signs of a fracture. Additional imaging involving a CT scan or MRI may be indicated in specific cases. Simple wrist fractures may be treated with casting and/or splinting. Complex wrist fractures with displacement often require operative fixation. Evaluation by an orthopaedic hand surgeon is recommended to determine the correct treatment necessary. If you are experiencing significant wrist pain and swelling after an injury, or were diagnosed with a wrist fracture, feel free to contact our office urgently to schedule an appointment. Arthritis is a very common ailment involving the joints of the body. Most people have heard of hip and knee joint arthritis, but a huge portion of the population has upper extremity arthritis. The arthritis can affect the shoulder, elbow, wrist and/or finger joints. 2 major forms of arthritis occur: Osteoarthritis and Inflammatory Arthritis. Osteoarthritis (OA) is much more common and involves gradual wear and tear of the joint. Inflammatory arthritis, like rheumatoid arthritis (RA), is much less common and caused by auto-immune/inflammatory involvement of the joint lining (synovial lining). Both forms of arthritis can interfere with daily activities. Patients present with pain, swelling, stiffness and overall decreased function as the arthritis becomes more severe. Evaluation by an orthopaedic surgeon is recommended to determine an exact diagnosis and treatment options. The evaluation involves a detailed history and clinical examination along with x-rays. Additional work-up involving blood work, CT scans and MRIs may be warranted in certain cases. A spectrum of treatment options exist for the treatment of arthritis. These options do vary depending if the cause is OA or RA. They include simple treatments like anti-inflammatories, splinting, or occupational therapy. Advanced arthritis may require more invasive treatments including steroid injections or a surgical procedure. Many people are under the misconception that treatment options do not exist for hand arthritis. If you have been experiencing prolonged joint pain, or have been diagnosed with upper extremity arthritis, feel free to contact our office for an evaluation. The hand is an intricate region of bones, ligaments, tendons and nerves. Hand pain is a relatively common problem that can affect people of all ages. The pain could present itself after injury/fall, or slowly over time without an exact cause. Common causes of hand pain involve nerve compression (eg carpal tunnel syndrome), tendonitis, arthritis, or sprains/fractures after injury. The work-up for prolonged or excessive hand pain should be performed by a hand surgery specialist. The evaluation frequently involves a detailed history and clinical exam followed by hand x-rays. Additional work-up involving blood work, nerve testing (EMG/nerve conduction velocity), or MRIs may be warranted in specific cases. Treatment for hand pain largely varies on the specific diagnosis. Options for treatment could involve simple interventions like anti-inflammatories, splinting and/or occupational therapy. However, more extensive treatment may be necessary using steroid injections or a surgical procedure. If you are experiencing significant or prolonged hand pain that is interfering with the activities you enjoy, feel free to contact our office to schedule an evaluation. Hands are very complex regions in the human body composed of 19 bones. Fractures of the hand are common injuries experienced by all ages. They frequently occur from falls, contact sports, and winter sports injuries. The hand is amazingly complex and essential for human function. Hand fractures can lead to significant impairment or disability in hand dexterity and function. Signs of a hand fracture include pain, swelling, bruising, decreased range of motion and inability to grab objects. Any suspected hand fracture should be evaluated on an urgent basis with x-rays. Delayed diagnosis of hand fractures can lead to limited treatment options and an increased chance of permanent disability. Treatment of hand fractures should be performed by hand surgery specialists. The spectrum of treatment for hand fractures largely varies on the specific fracture itself. Some fractures are treated as simply as taping fingers together or short-term splinting. However, some hand fractures may need surgical treatment involving placement of pins or plates and screws with a more prolonged recovery process. If you have been involved in a recent injury and concerned about a possible hand fracture, or if you have been diagnosed with a hand fracture at an ER or urgent care, feel free to contact our office to schedule an appointment. Lacerations are cuts to the skin that are commonly seen in the hand area. Hand laceration can be simple (involving only the skin) or complex involving deeper structures like tendons, nerves and/or blood vessels. Due to the complexity of the hand and the risk of significant injury, any laceration needs to be evaluated on an urgent/emergent basis. Injuries to tendons, nerves and/or blood vessels can lead to significant disability and decreased hand function. Patients with numbness or inability to flex or extend a finger are at high risk of having a cut tendon or nerve. These patients need an urgent evaluation and careful clinical exam to further determine the extent of injury. The treatment of lacerations can be as simple as a bandage or sutures to close the wound. However, complex lacerations may need surgical repair of tendons, nerves and/or blood vessels. These types of injuries are best treated when repaired within a week of injury. The recovery process after surgery to repair these structures can be rather prolonged with extensive occupation therapy. If you have experienced a hand laceration, feel free to contact our office for a prompt evaluation. The shoulder is girdle is composed of the ball and socket joint, the attachment of the clavicle to the sternum and the attachment of the clavicle to shoulder blade. Overlying this is a complex system of ligaments, joint capsules, tendons and muscles. Shoulder pain can arise from any number of these structures and may be from simple degeneration, trauma, an inappropriate exercise regimen or may be of insidious onset and without clear etiology. Evaluation begins with physical examination and x-rays from three different views. This is often all that is needed to diagnose your shoulder pain. On occasion an MRI or ultrasound may be needed to further evaluate the soft tissue structures of the shoulder. Treatment may consist of oral medications’, exercise at home or with a therapist, injections and on occasion surgery if required. If you are experiencing ongoing pain in the shoulder with difficulty with range of motion, weakness or difficulty sleeping, feel free to contact our office for a complete evaluation and treatment recommendations. The elbow is a complex joint that allows for positioning of the hand in space. Pain in the elbow can cause significant difficulties with lifting and everyday activities such as shaving, eating and washing ones hair. Common causes of elbow pain include trauma, tendonitis, arthritis and bursitis. Evaluation begins with physical examination and x-rays from three different views. This is often all that is needed to diagnose your elbow pain. On occasion an MRI or ultrasound may be needed to further evaluate the tendons and ligaments of the elbow. Treatment may consist of oral medications’, exercise at home or with a therapist, bracing, injections and on occasion surgery if required. A number of minimally invasive techniques are available for the treatment of tendon injuries if required. If you are experiencing ongoing elbow pain which limits your normal activities feel free to contact our office for a complete evaluation and treatment recommendations. A tendon is what attaches a muscle to a bone. Tendonitis is the inflammation, degeneration or irritation of a tendon. Tendons may be irritated from degeneration, overuse, or where they run under a bone or through a fibrous tunnel. Tendonitis can cause pain, limited range of motion, sleep disturbance, as well as clicking and locking of joints. Treatment of tendonitis may include oral medications, rest, bracing, or exercise depending on the tendon irritated and the cause of this irritation. In some areas cortisone injections greatly decrease pain which allow one to exercise more and rid oneself of the pain of tendonitis. In other areas particularly around the hand and wrist, cortisone shots are highly curative with complete long term relief of symptoms with a single injection. More severe tendon irritation or partial or complete tears may require minimally invasive, arthroscopic or open surgical techniques to provide lasting relief. If you are experiencing ongoing pain, which you believe may be due to a tendon issue, feel free to contact our office for a complete evaluation.